We know the shortest distance between two points is a straight line. Some horses at some times also know this. But it is interesting to observe the other routes horses take which must be perfectly normal to them. Right now we have our 3 horses out on 3 separate pastures. In the morning when I jingle my mares, I first go to Aria’s pasture and when I rattle the metal gate her head comes up, she does a turn on the hindquarters until she faces me and then walks a straight line to me, sometimes not so fast as I’d like, but basically a straight line. Her walk to the gate is downhill. Then I go to Seeker’s pasture gate – of course by then, she knows “its time” so she has started walking up to the gate. Her trek to the gate is all uphill. The path she chooses is quite interesting in that she probably covers twice as much ground as she would if she came straight to the gate. It is obvious that her choices are based on ease of travel. Instead of coming directly uphill toward the gate, she weaves back and forth…….like a sensible mountain trail horse I guess. Then there is the energizer bunny Sherlock. When Richard goes out to call him in, as soon as he whistles, Sherlock kicks into his floating, ground covering canter, but because he loves to move, he takes the scenic route. There is no doubt that he is definitely on his way to Richard but he might canter the entire perimeter of the 20 acre pasture on his way there. Very fun to watch. And even with all that traveling, he probably takes less time to get there than the girls do when I call them ! Horses. What a treat to observe. Horse Rubs Mane Off… Or Does She? I’ve noticed lately that my TWH mare seems to be rubbing her beautiful long wavy mane off. I noticed several weeks ago that part of her mane near her withers suddenly became very short. I figured maybe she got it caught in something and I did not really worry about it too much. But now I’m noticing that the short part keeps getting bigger and bigger. I suspect that she is rubbing it on something but I’m not sure what. She is pasture kept most of the time with her buddies. If she is not in the pasture then she is in the dry lot with her buddies with hay in hay nets. I can’t seem to find any evidence on the fence or anything. Her mane does not look irritated or anything, just short. I never catch her in the act. I’m worried that if this continues, her beautiful mane will be all straggles. To make matters worse, I was planning to sell her in the next few weeks. I know it can take years for a mane to grow back completely. Is there anything I can do? It sounds more like your mare and one of her pasture buddies are participating in vigorous bouts of “mutual grooming” that normal social activity where two horses stand next to each other facing opposite directions and scratch each others neck, withers and back with their teeth. This results in lost mane hair right where you describe. That’s one of the drawbacks of group turnout but the horses sure seem to enjoy it !! As far as what you can do about it, you can separate the mare from her buddies, you can get her a textilene fly sheet with a neck extension, or you can spray a safe anti-chew product on her mane area. There are several products specifically designed for this. Horse Charges us in Pasture – Help ! My 20 year old niece has 5 horses one being a 4 year old paint. He has become very territorial of his field so much so that he will charge anyone that walks through the field. He has even charged up to the fence if someone is standing near by. How can we work with him to change this behavior? The horse (I assume it is a gelding, if not, write me back and I’ll modify my answer) should be brought in from pasture to a separate training area, away from other horses and in a place that is safe to work. A 40-50 foot diameter round pen or 40 x 40 square pen works well for this. The horse needs to learn basic in-hand and free exercises and the lessons must be repeated until the horse is obedient and submissive to humans. When a horse is dominant over other horses, that’s OK, that’s horse natural behavior. But when a horse acts dominant over humans, it is dangerous and the horse needs to be shown a different, safer way to act around humans. Distilling things down in a smaller enclosure will help make the positive associations, then you will have a better chance of reminding the horse when you return him to the pasture group. Some of the lessons he will need to learn are in this In Hand Checklist – a review of things he already knows will be helpful too. Teaching him to Respect Your Personal Space is essential. More on Personal Space here. 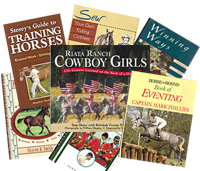 I have hundreds of articles on horse care and training on my website. Be sure to search there for your topic of interest. just wondered if you have any ideas how to stop out yearling miniature horse filly to stop bucking and kicking out at us. We own 6 other miniatures and have never had this problem . We have her for 6 months now, and still she does it. We cant stand behind her to brush her tail, nor adjust her rug leg straps etc. She is out on grass with the others and as soon as we go to bring her in, she spins and lashes out with her rear legs. She also hates to be tied and gets very thick and starts pawing the ground etc. Young fillies of that age are beginning to experience their estrous cycle for the first time. Because of that, some are more explosive, irritable and protective, especially of their hindquarters and activities related to their rear end, such as you say brushing her tail and adjusting her leg straps. There are many articles related to your questions on my Horse Information Roundup. I will mention a few, but you should go there and search your questions. A horse like that needs a super thorough handling and sacking out program to show her that touching and activities behind her are nothing to fear. This is a good time to nip this tendency in the bud – otherwise the horse could carry the bad habits for life. No Fear of Restriction or Restraint.